It has always been a delight to see more young students who have started to take up responsibilities for betterment of the society. Read on to know how two college students went on to creating a platform, that currently serves a lot of school students to help solve their problems! “Whenever we travel to a destination and if we do not know the way, we first ask someone who is travelling that way or might have travelled that route earlier. That helps us reach the right destination faster. This applies to humans in everything that they do. Whenever we want to achieve something, the possibility to do it increases when we get guidance from someone who has walked the path we wish to take and is the same concept we have tried to bring in, for school going students” says Amit Kumar, a final year architecture student from Birla Institute of Technology Mesra and the Co-Founder of EL-CUBUS, a platform that provides personal assistance to students in the educational domain that the students wish to pursue. The platform also provides support to students who face problems with peer pressure, or those who need guidance to manage time, and other personal problems that they face. 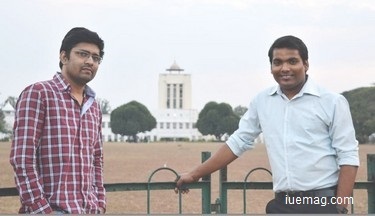 It all started in 2011, when Amit and Shubham Gupta (Co-Founder) were pursuing their first and second year of college respectively. It was during the semester holidays, when they were discussing about how students continue to complain about the kind of problems they have in school and do not even come back to school after graduating, to correct the problems in school. So, they decided that they would reach out to their school and speak to the students and create awareness in them. They began to motivate the students at schools, and also shared their contact details, so that the students could connect back with them in case of requirement of any help. There were students who started calling Amit and Shubham, to help solve their problems regarding studies, coping up with examinations and other personal issues. The idea of these two young boys slowly transformed when they found that the students actually needed someone, who could guide them when they would not know what to do, when they had pressures, when they had to face examinations, when they wanted someone to tell what to pursue next, and when they wanted someone who could help them at certain points of life where they could not manage. This became the concept of EL-CUBUS. Along with guidance, they have continued to empower kids by getting them to participate in competitions. They organized an event where the students were asked to create various powerpoint presentations. 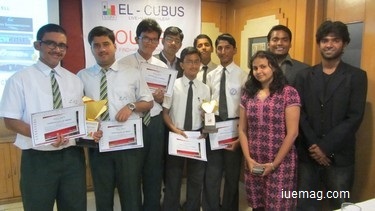 The event had participation of 83 teams, comprising of 3 students each. While the competition witnessed some truly talented students, the judges were surprised and astonished to see such young, school going students being able to create such presentations which were astounding. 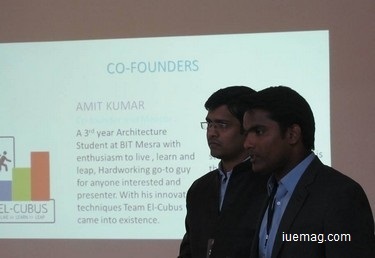 The ideation of Amit and Shubham to have helped the students realize their true potentials were much appreciated. “This year, we are in the process of forming an educational facilitation organization and we will soon expand our services to various states in India” he states. It is a pride to see such young guns, who do not give reasons like the rest, about not being able to make time for helping out the others, due to priorities like studies. A very important point that Amit shares to such youth is, “All of us hold responsibility for the growth of the nation. If we are not able to make time to solve problems within the country and help someone, then we do not have the rights to ask when something goes wrong with us or others, due to the problems in the society. I am also like each of you who have priorities like studies, family and finances, but that does not mean I do not make time for the society, because that also falls in my list of priorities. It is all about prioritizing your nation as much as yourself and your family; infact, all of us are in a same family, that is, the family of ‘Human Beings’. Let us help each other grow!”. Such words from someone of his age, is hard to believe, but only increases the faith in the youth, who continue to put their efforts in transforming themselves and the society. Amit could be connected through Facebook. You could also visit the Facebook Page of EL-CUBUS to stay updated about their continuous efforts. Any facts, figures or references stated here are made by the author & don't reflect the endorsement of iU at all times unless otherwise drafted by official staff at iU. This article was first published here on 24th March 2016.